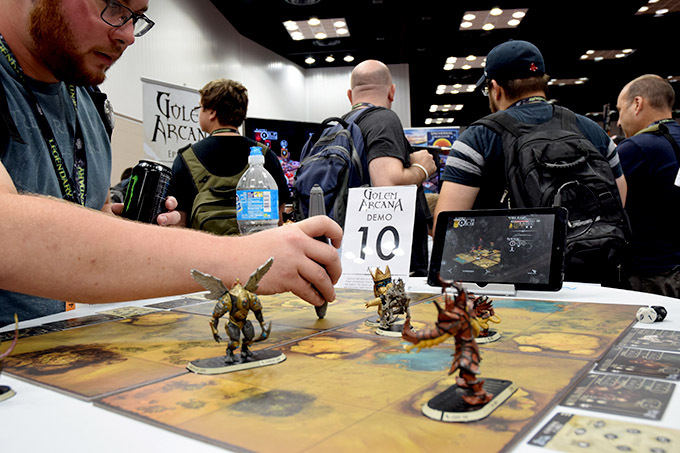 GenCon is the biggest gaming convention of the year for North America, and that means lots and lots to see and do! 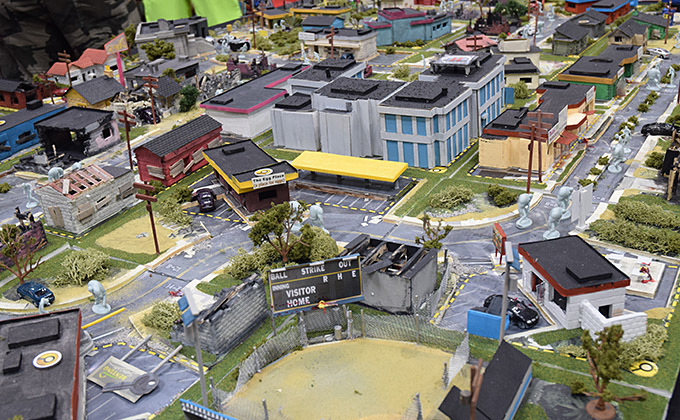 As is the custom here on Dice Hate Me, I make sure to take lots of photos to share with all of you, dear readers, so that if you didn’t get a chance to go to the big show you’ll at least get a taste of what you missed – and can make plans to head there next year! Enjoy! 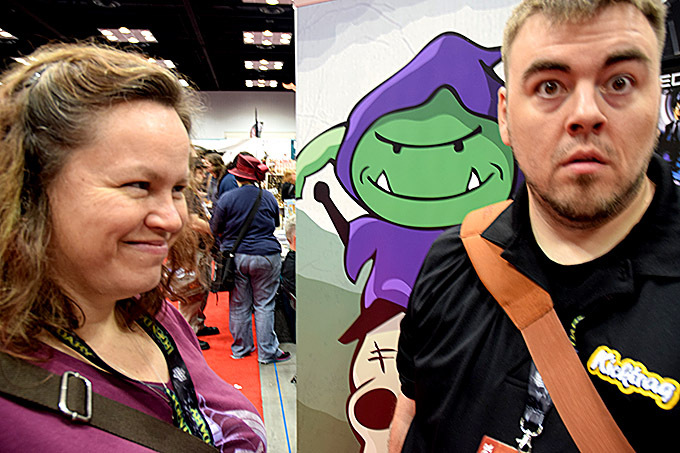 The theme of this year’s GenCon could have been “The Show of the Selfie” – and we took tons. On Wednesday afternoon, Dan Patriss and I hung out with Stephen Buonocore of Stronghold Games and Mike Fitzgerald, designer of Diamonds. 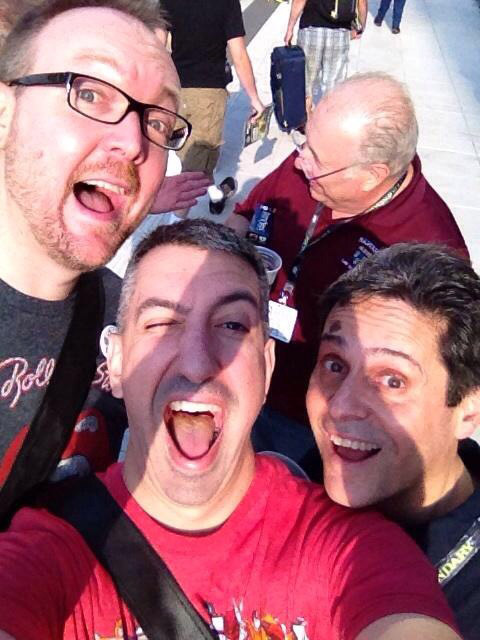 Here is a selfie of myself, Dan, Stephen and Mike, doing an “I’m too cool to be in this picture” photobomb in the background. 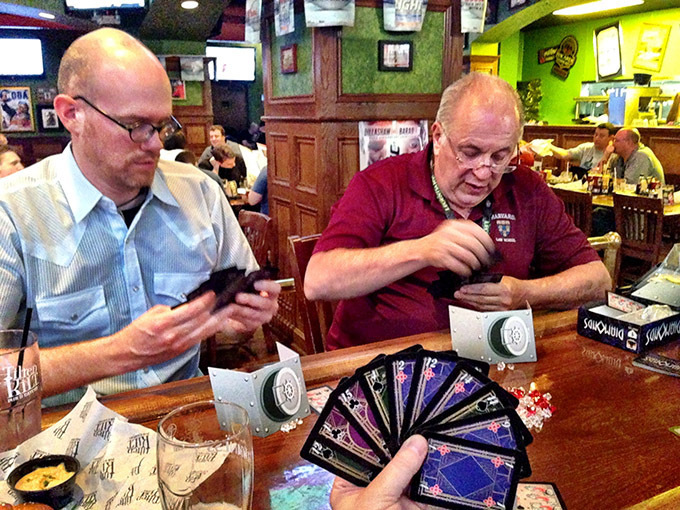 A definite highlight of the con was getting a chance to talk with Mike Fitzgerald at our annual Wednesday hangout at the Tilted Kilt and play Diamonds. Lagoon designer David Chott joined us, and we found out that Diamonds is one of the best trick-taking games of all time. No hyperbole. 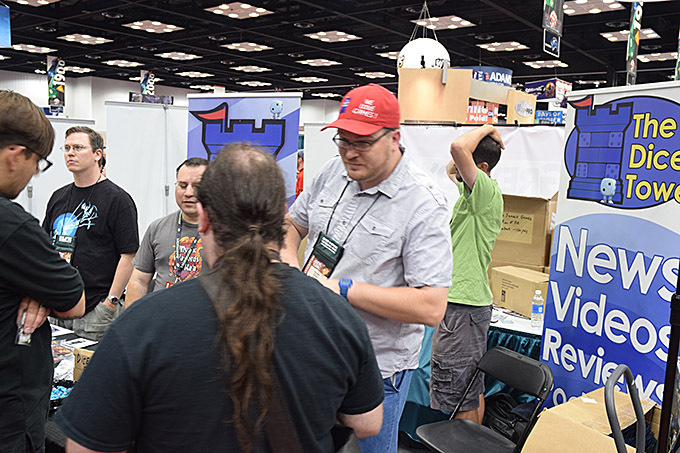 No show would be complete without hanging with the Fleeples – Matt Riddle and Ben Pinchback – and just like last year, I got a chance to play Eggs & Empires. I don’t think any show from here on out will be complete without playing this awesome pub game. 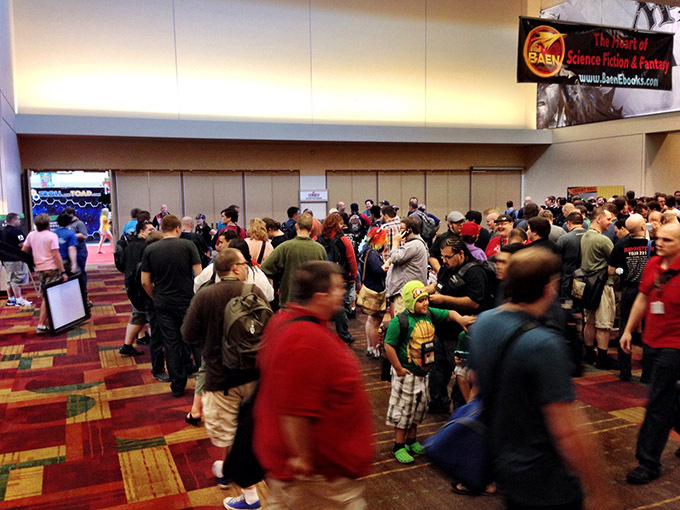 Thursday morning is the start of a tradition among the most diehard GenCon attendees – what I like to call The Running of the Bulls. That’s when everyone lines up outside the Exhibitor Hall for a chance to snag all the hot games. I stole TC Petty’s exhibitor badge so I could get into the Exhibitor Hall early and complete my hot games list early. Here I’m stalking the Gale Force Nine booth just before sales started at 9 a.m., hoping to get Sons of Anarchy and the Blue Sun expansion for Firefly. I got both, for the record. Score. 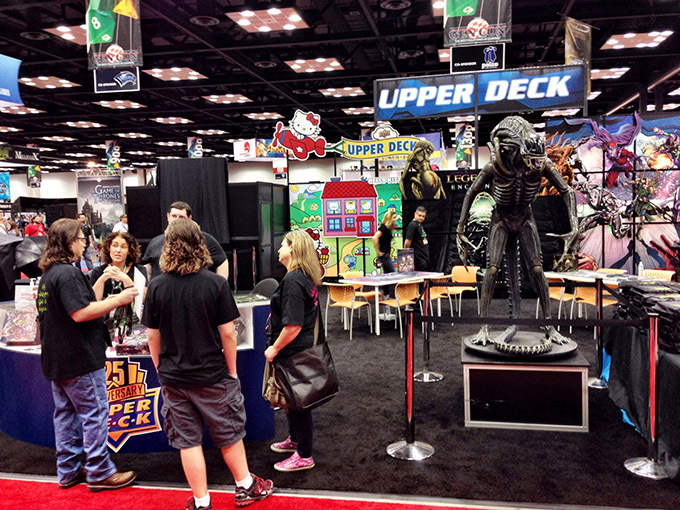 The Upper Deck booth sported a life-size Alien in honor of their new release, Legendary: Encounters. I didn’t grab a copy, but Dan Patriss did, so I’m looking forward to playing his copy very soon. 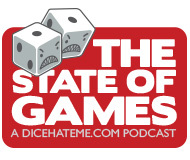 Speaking of Dan Patriss, here he interviews Mitch Gitelman of Harebrained Schemes – the makers of Golem Arcana. 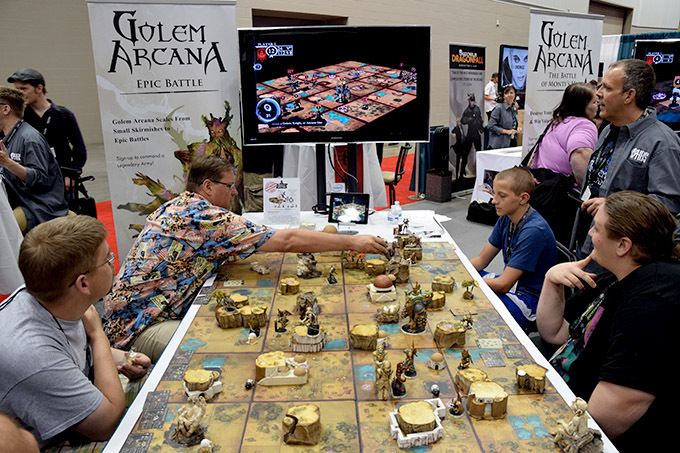 A look at the Golem Arcana booth. The game uses special pens that read tiny barcodes on everything in the game which translates to the smart-device app which facilitates and adds to gameplay. It’s pretty awesome. 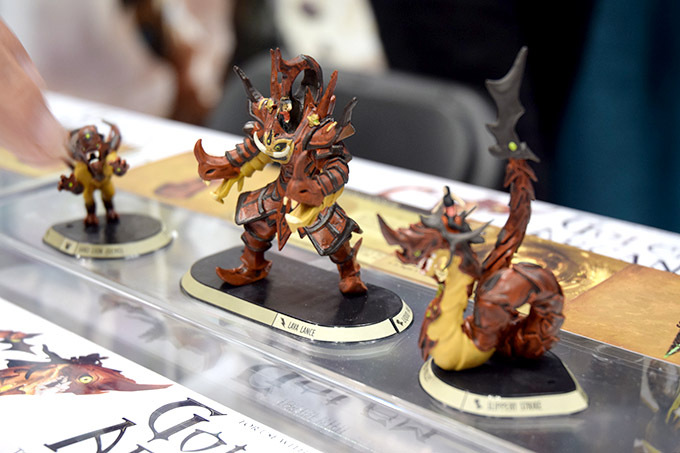 A closer look at some Golem Arcana miniatures. 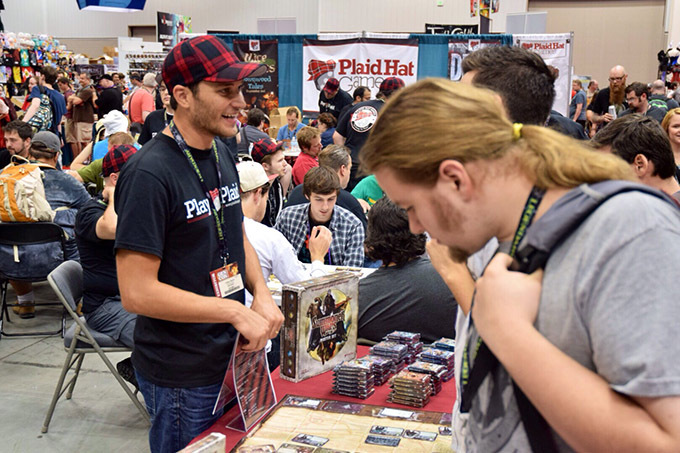 Colby Dauch of Plaid Hat Games doing his thing. 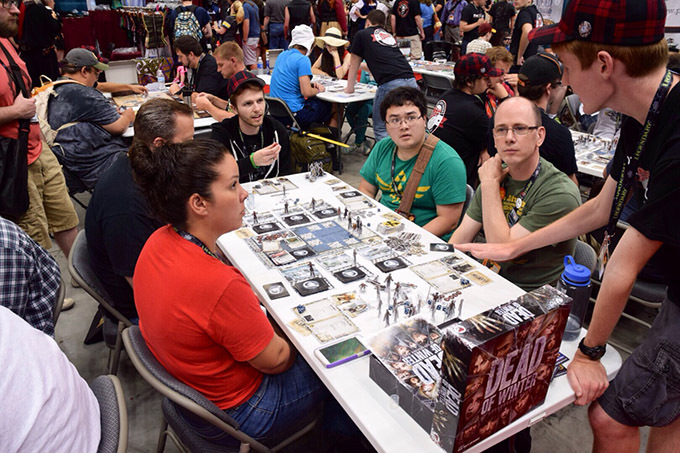 A demo of Dead of Winter in the Plaid Hat Games booth. 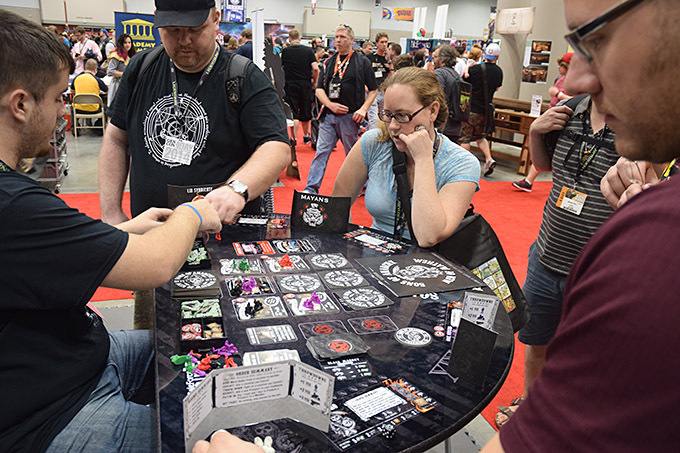 This hot game sold 400 copies in a couple of hours at GenCon. Luckily, I was able to snag a copy and I can’t wait to play. 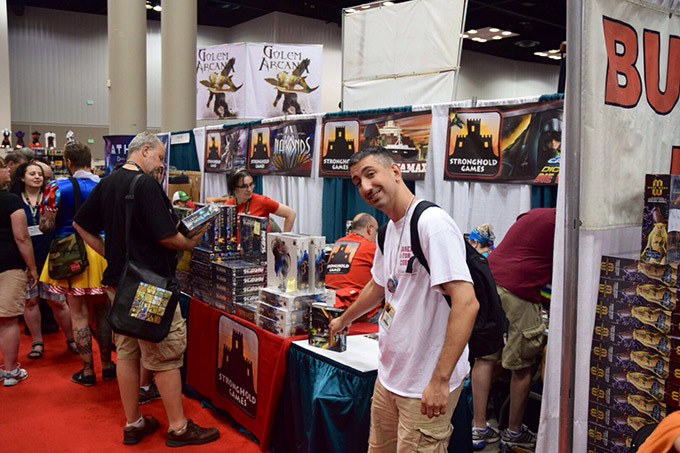 Dan Patriss in front of the Stronghold Games booth. 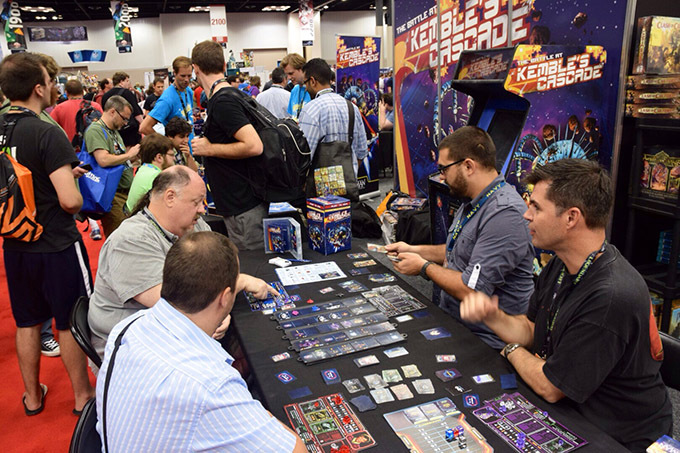 I was on the fence about Battle at Kemble’s Cascade from Z-Man Games, but they went all out with the demo area for the game. I eventually relented and bought a copy at the end of the show because of all the good buzz. One title I picked up was the card-drafting title Among the Stars. I got a chance to play it with Dan and TC Petty on Thursday night – and I was less than enamored. However, we played a weird version of the game that didn’t exactly work, so I’m looking forward to trying it again since so many players are enjoying it. 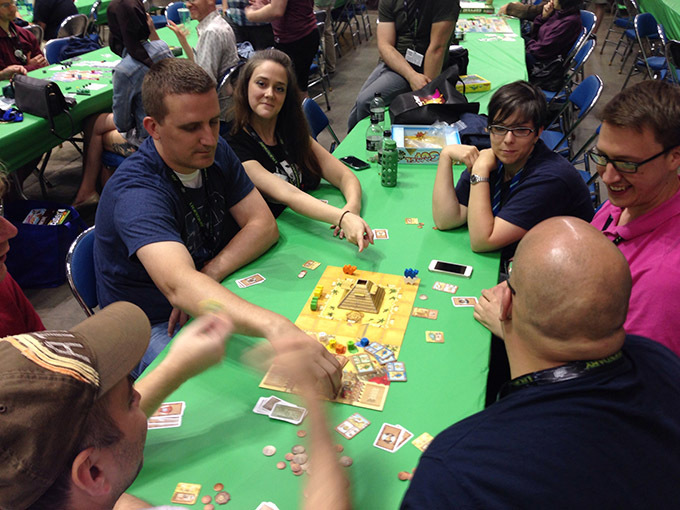 Possibly the game that saw the most play at GenCon was the Spiel des Jahres winner Camel Up. Z-Man had it for sale there, and it’s the one title that I regret not picking up. 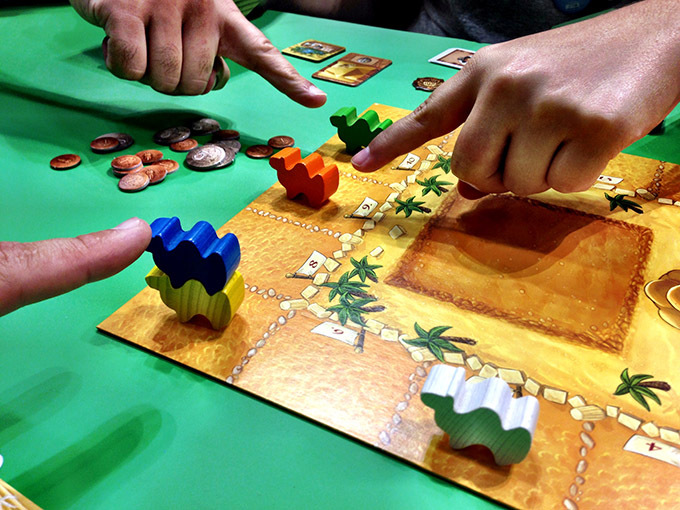 This camel-racing game is so easy to play, with truly rewarding gameplay and press-your-luck tactics. 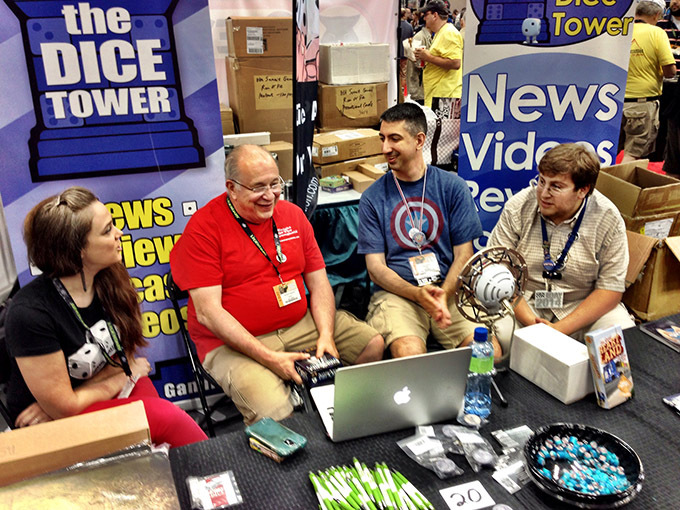 On Friday, we got a chance to record a portion of the Geek All-Stars podcast in the Dice Tower booth. 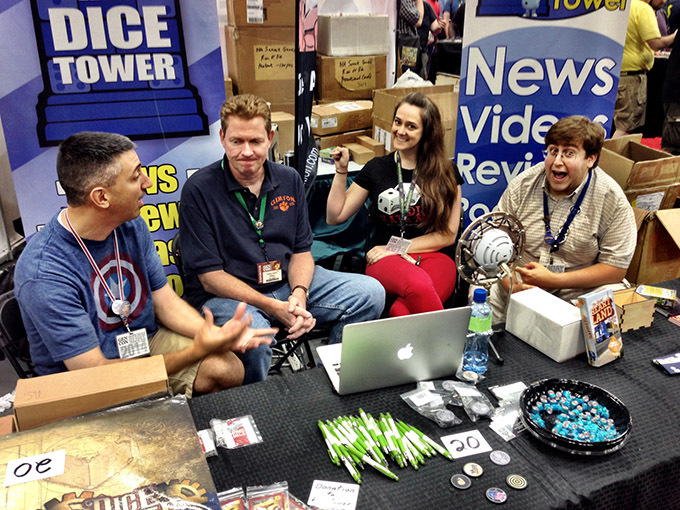 Here you see Stephanie Straw, Dan Patriss and guest co-host Eric Handler discussing all the cool stuff at the con. 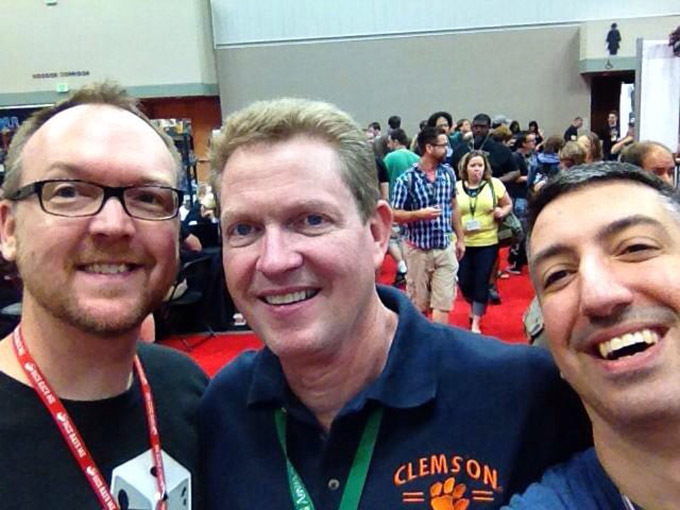 We were lucky enough to snag game designer Richard Launius for an interview during the podcast. 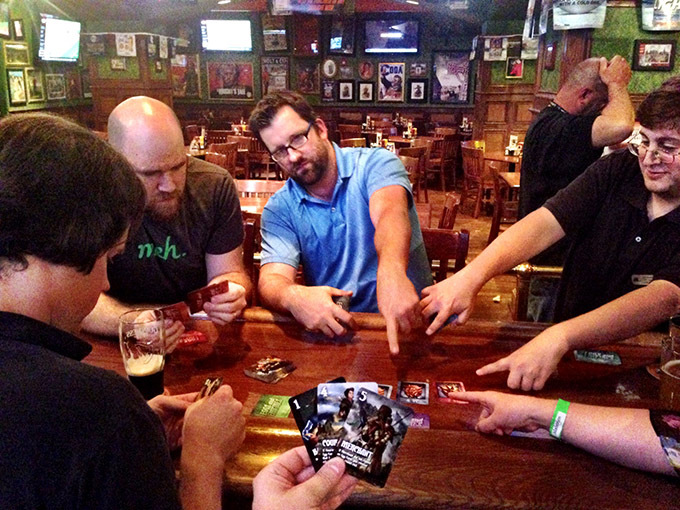 We talked about Defenders of the Realm, Lovecraft, and his newest design Run, Fight, or Die. We also got a chance to interview Diamonds designer Mike Fitzgerald. He’s such a great guy, with lots of amazing stories from his days in radio. Another selfie! This time with Sir Richard Launius – the greatest guy in the industry. 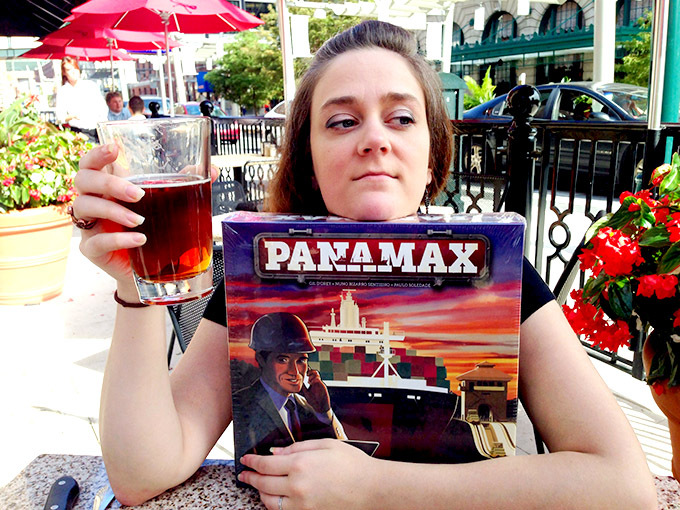 Here Stephanie Straw models two of her true loves – beer and Stronghold Games titles. 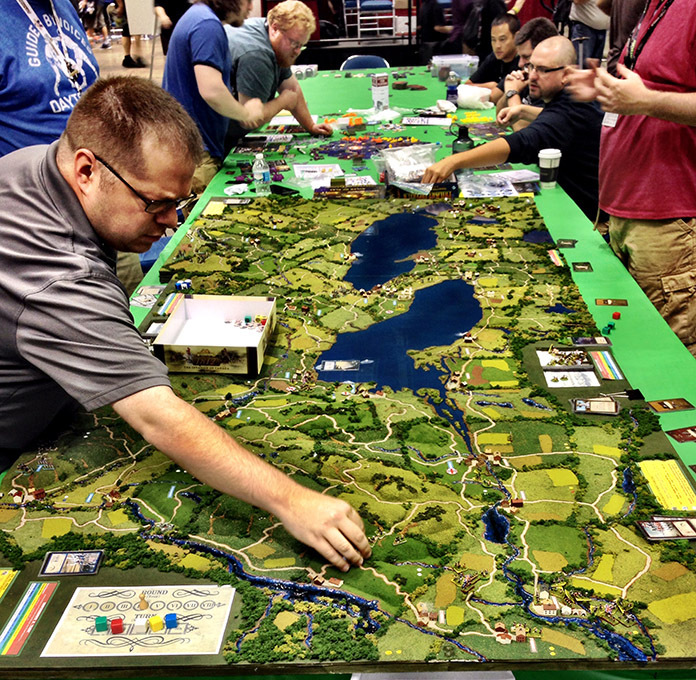 This custom board for 1812 was amazing. 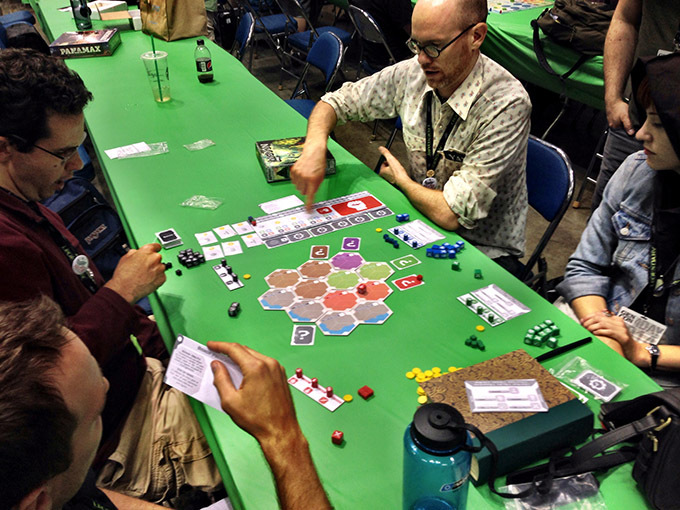 As is our custom, we all gathered in Hall D after hours to play unpublished prototypes in our impromptu Unpub area. 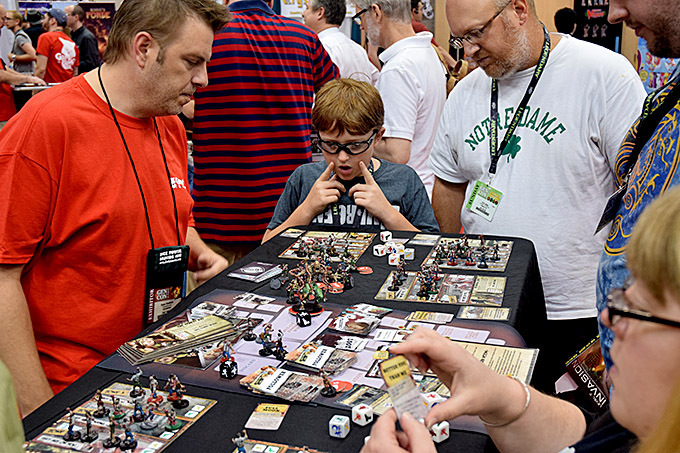 Here we see David Chott, Ben Rosset and company playing Adam McIver’s upcoming Kingdom Land. 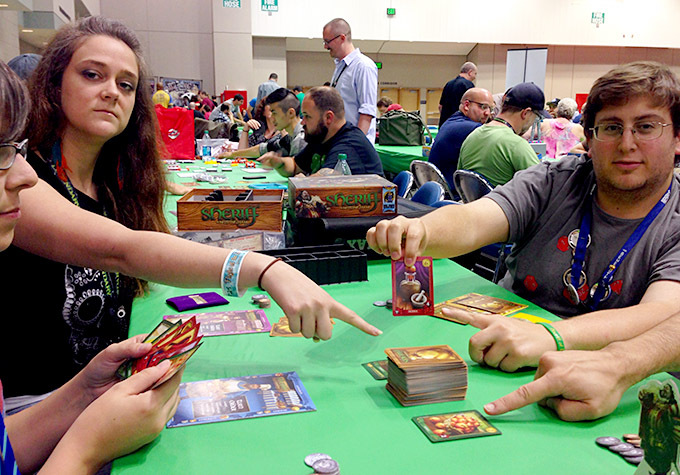 Saturday night at GenCon was pretty awesome, as Stephanie and I got a chance to experience True Dungeon with local friends Jed & Ashley Humphries. True Dungeon is sort of like Live Action Role Playing in a physical dungeon with puzzles and physical combat against baddies. 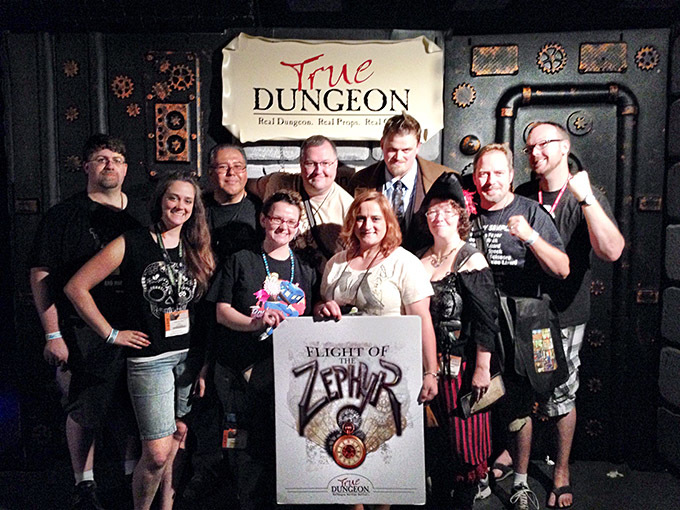 It was an amazing experience, and I look forward to running another dungeon next year! After True Dungeon we tried our hand at Sheriff of Nottingham, a social game of trying to sneak contraband past the titular sheriff. Most everyone involved with the game had a great time, and it’s a very good, structured social game for those who do not normally like social games. 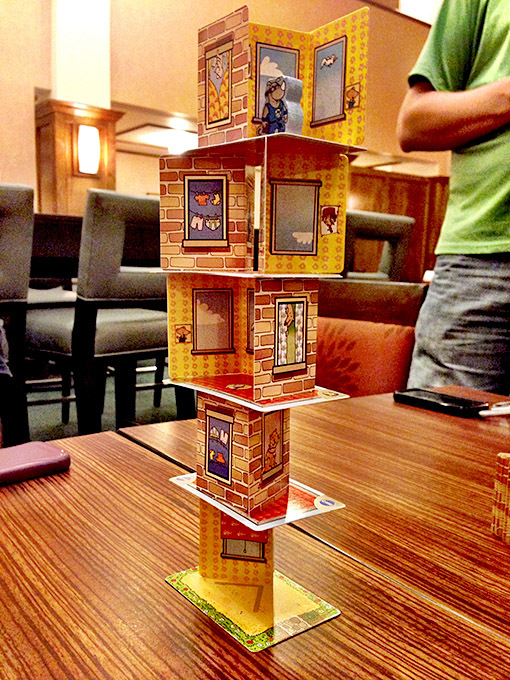 One of the surprise hits of the con was HABA’s Rhino Hero. In this card-stacking game, players stack cards and play cards from their hand to challenge other players, trying their best not to knock over the ever-growing tower. 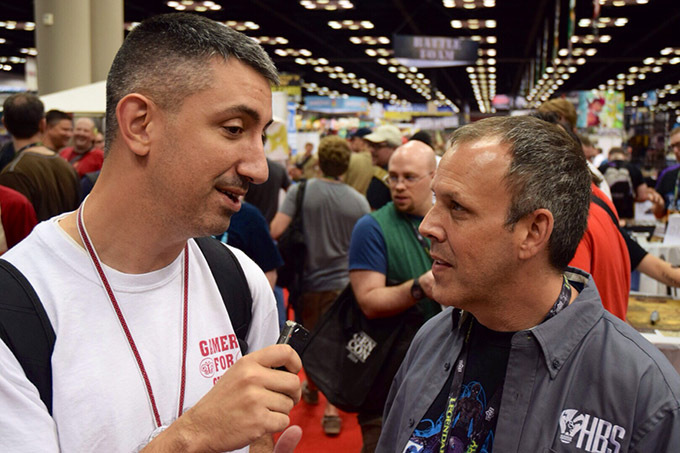 It was so good to see HABA at GenCon – their first time at the show – but guaranteed not to be their last! 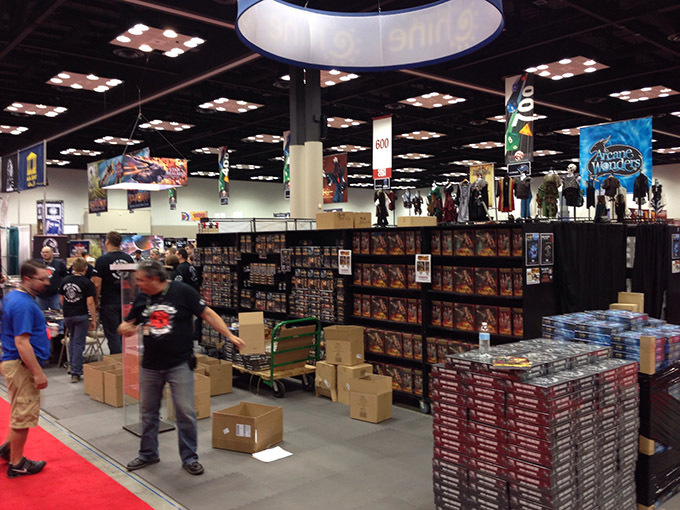 A view of the biggest booth at the con – Fantasy Flight Games. 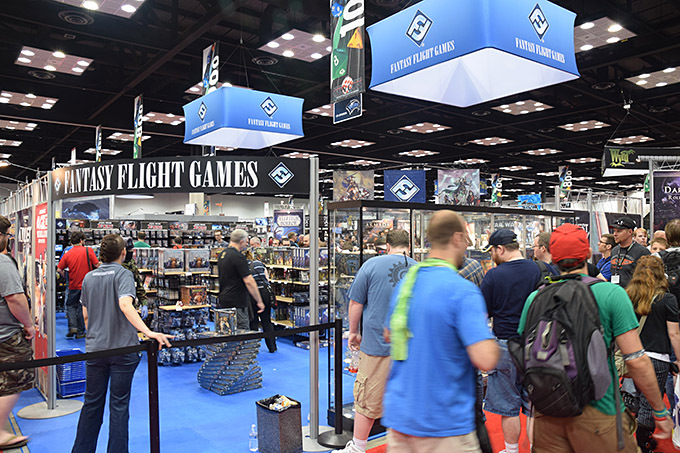 FFG was on the top of their sales game this year, with a system that kept gamers moving along at quick clip, saving time and energy. They really set the bar high, and I hope vendors at future shows pay attention to how they ran things. 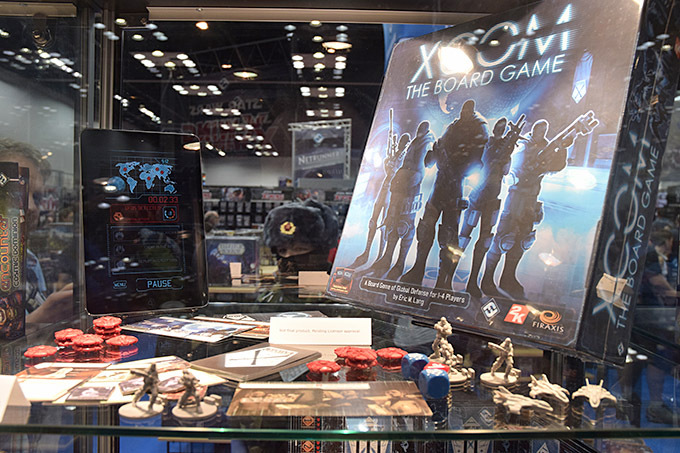 FFG also had promo copies of the upcoming title X-Com at the show. Unfortunately, I wasn’t able to get a closer look at all the components, but from what I saw behind the glass, it looks amazing. Sons of Anarchy demo at the Gale Force Nine booth. 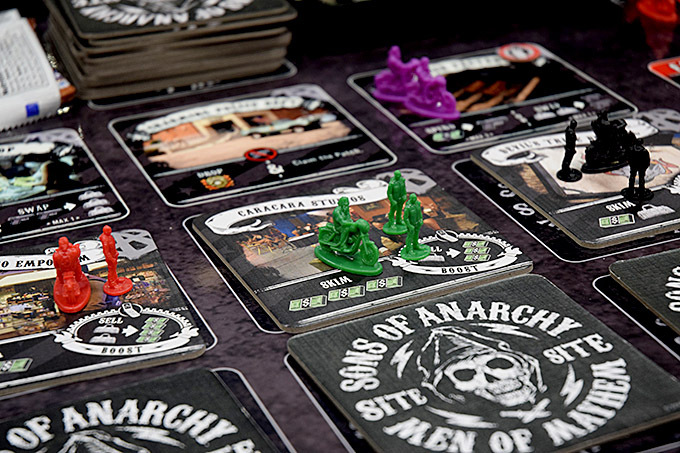 A close-up of some of the Sons of Anarcy components. I cannot wait to get this to the table. Jayne searches for just the right mini. 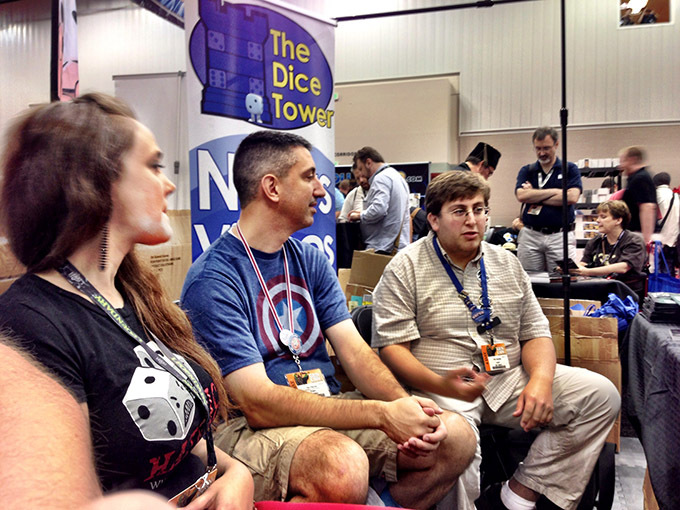 Here we see a wild Tom Vasel in his native environment – greeting fans in the Dice Tower booth. Another surprise of the con was Richard Launius’s Run, Fight, or Die. Did we need another zombie game? The answer to that is a resounding YES. Loads of fun. One great thing about Launius is that he takes time to pimp out all of his demo copies by hand-painting all the miniatures. 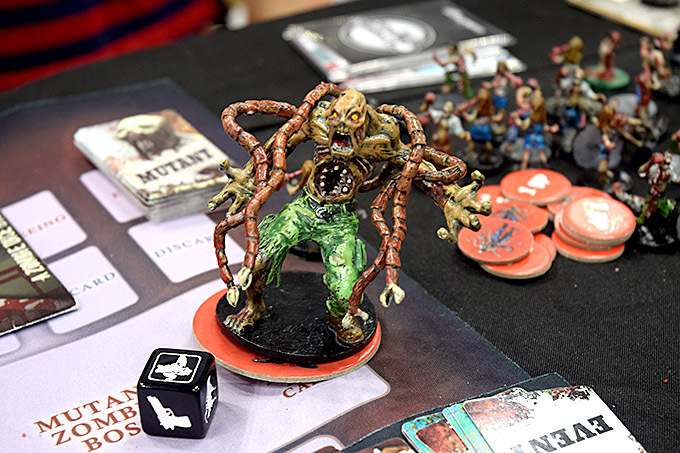 Here we see a close-up of the huge mutant zombie boss for Run, Fight, or Die. I got a chance to surprise Mr. and Mrs. Kicktraq when they least expected it. 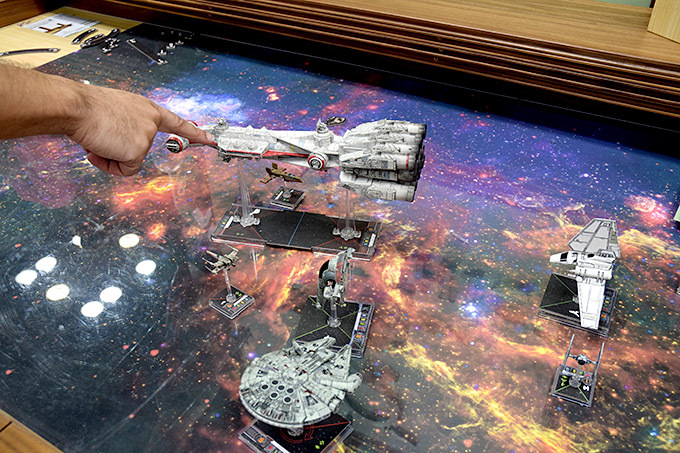 X-Wing set up on one of the gorgeous Geek Chic tables. 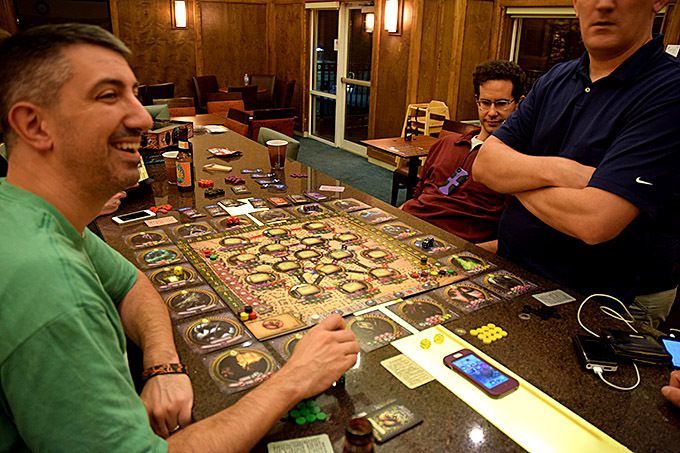 An amazing custom town table for iELLO’s Zombie 15 demo. 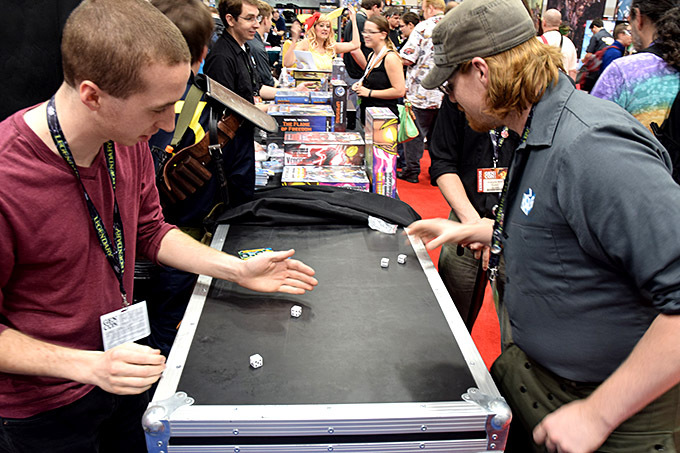 Angry Dice throwdown in the Greater Than Games booth with Craig McRoberts. 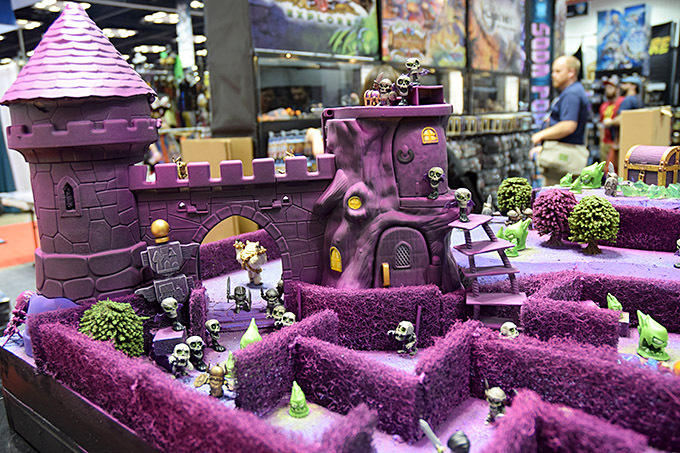 GenCon always has awesome custom demo spaces, and none were cooler than some of the set-ups for Super Dungeon Explore by Soda Pop Miniatures. 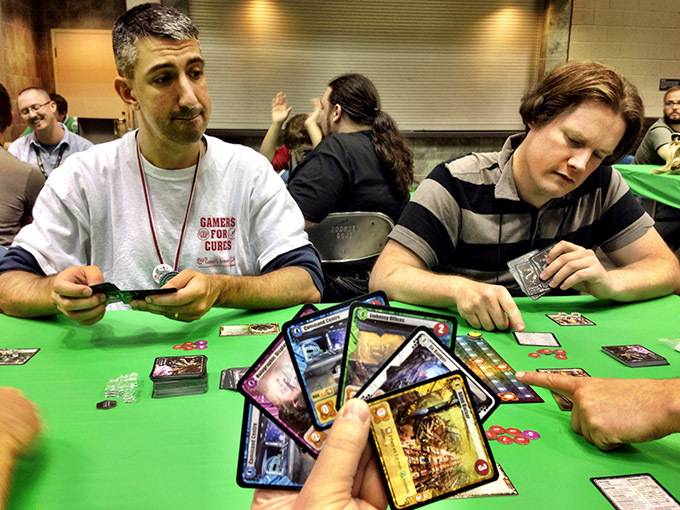 One game that wasn’t even on my radar was Passport Games’ Kingsport Festival. The game was described to me by Tom Vasel as “Kingsburg with Cthulhu” so I couldn’t resist picking up a copy. I’m so glad I did, as we got a chance to play it on Sunday at the end of the convention and I loved it. 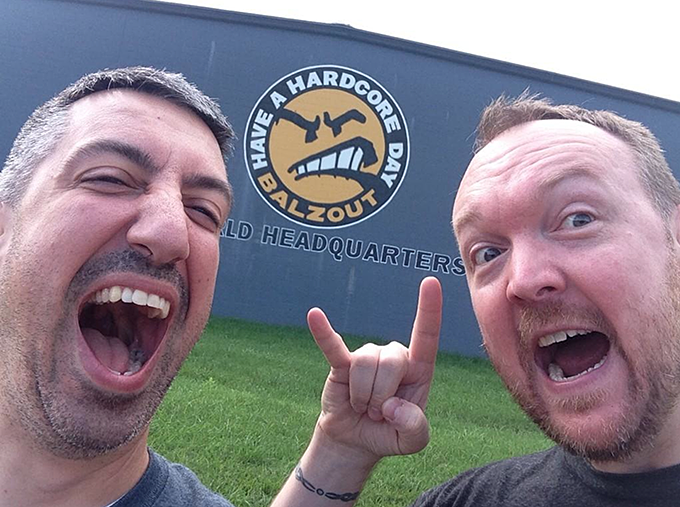 One road trip tradition is a stop in Nitro, West Virginia, so Dan and I couldn’t resist a selfie in front of the Balzout World Headquarters in the shadows of the giant nuclear power plant towers. And, last but not least, the final game haul from GenCon. Many have been played, but there are still SO many to get on the table. 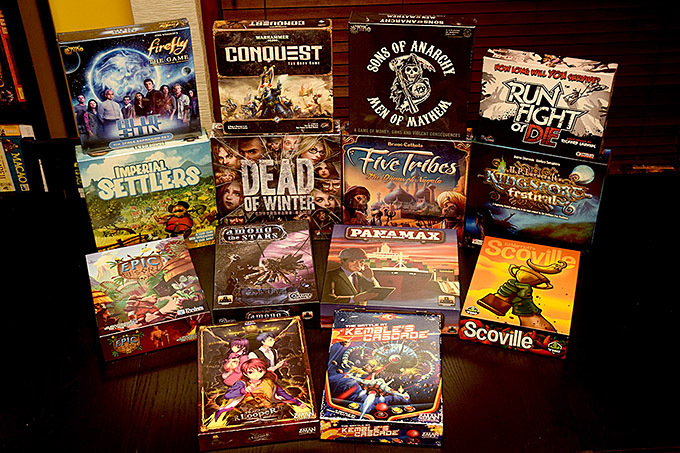 Look for reviews of many of these on Dice Hate Me, and be sure to listen to the latest State of Games podcast for discussion of those we managed to play! 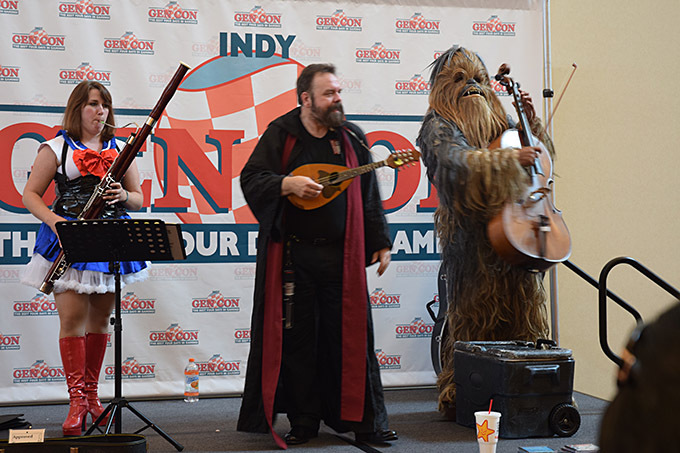 As usual, GenCon was an amazing experience. I took so many more photos, but these are the main highlights. If you haven’t been to the big show make sure you mark your calendars for next year. 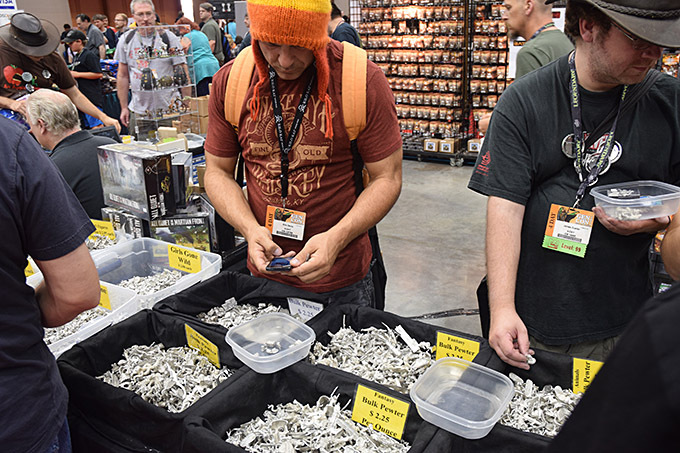 And if you’re a veteran of GenCon, we hope to see you there again next year! “Kingsburg with Cthulhu” – Sold. Great recap Chris. Had a blast hanging with you! I used to live around there! Unfortunately, it’s still a coal-fired plant… just a HUGE one. Whoa. Not sure how I got here (my son was watching the Elder Sign episode of Tabletop, which led to me finding the review on your site, which led to me clicking through a bunch of other posts, which led to this one), but imagine my surprise as I was scrolling through a list of pictures on a site I didn’t previously know existed and stumbled across a picture of my son and I playing Run, Fight, or Die at GenCon! Great game, great recap, and great site. Chris G – That is so awesome that you ended up here! Thanks for the kind words, and for providing the setting for a great pic.